In the midst of a turnaround that kicked off in 2012, Tuesday Morning is doing a lot of things well. CEO Steven Becker can point to four consecutive years of overall sales growth, same-store sales growth and increases in net sales per square foot (and the team at Chain Store Guide believes that these trends will continue in the short term). It’s a turnaround strategy heavily predicated upon real estate. 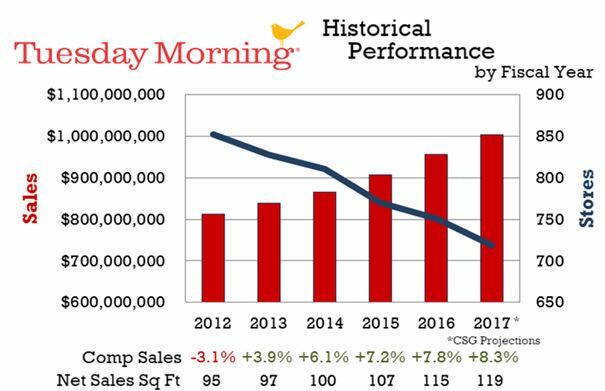 As the graphic shows, Tuesday Morning has tightened its net store count by about 100 units (13%) in four years, but store closings are only part of the story. In Fiscal 2016, the retailer closed 16 stores, relocated 46, expanded 7 and opened 16. The plans for Fiscal 2017 call for 30-35 closings, 20-25 new stores, 15-20 expansions, and 50-55 relocations. That kind of activity has produced positive results, but it comes at a price. The expense side of the equation drove profits down to $3.7 million in Fiscal 2016 (FYE 6.30.16) from $10.4 million the previous year (which followed net losses in FY 2014 and 2015). Four years in and although many signs point positive, it’s a mixed bag. One thing is certain: Tuesday Morning won’t come out the other end until the real-estate map is reset in stone and the associated expenses end. 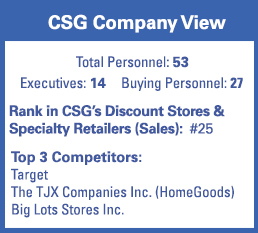 Source: Chain Store Guide Database of Discount, Dollar & Specialty Stores. *CSG projections based on proprietary analysis and company statements. Actual figures are subject to change. This data is not intended for investment decisions.